Breakfast comfort food at its best! 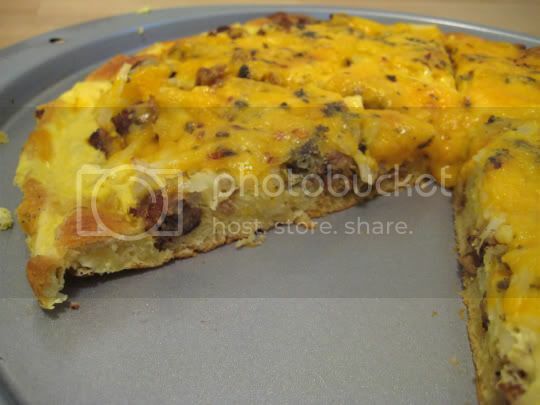 This pizza combines a buttery crescent roll crust; crumbled veggie sausage, hash brown potatoes, and lots of cheddar cheese; all topped with an egg-spice mixture that is to die for. It's everyone's favorite breakfast foods...all in one slice. The crescent roll crust didn't quite hold all of the egg mixture during baking, but I was able to easily remove the excess egg that spread out onto the pan and then find the crust. The dough was very thin and not terribly easy to work with, but I would not try using pizza dough, as I think the flaky, soft crescent roll went wonderfully with the rest of the ingredients. Once you compile the pizza, you will see that it's very big, toppings-wise, rising at least a couple inches in height. But sausage, potatoes, and cheese...mmmm, the more, the better. The egg mixture contained dried sage (which really brought out the "country" sausage flavor), red pepper flakes (which gave the pizza just enough bite), and salt. A half teaspoon of salt was called for in the recipe, but I would definitely cut it down the next time, as the pizza was a bit too salty. Make again? Hell yes. I could even imagine a nice drizzle of maple syrup to top this off.